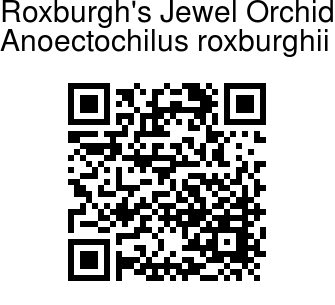 Roxburgh's Jewel Orchid is a miniature to small sized terrestrial orchid in rich humus in damp crevasses with heart-shaped to ovate-pointed, velvety, dark lime-green golden-netveined leaves. Leaves are are purple black on the underside. The plant blooms in the fall on a glandular-velvet-hairy, 25 cm long, 2-15 flowered inflorescence with ovate, 1 to 3 veined, glandular velvet-hairy dorsally bracts carrying successively opening flowers. Sepals and petals are pale brownish, lip white, spur pale pink. Petals are smaller than the sepals, inverted-lanceshaped, with hooked tips. Base of the lip adpressed to the face of the column and with two calli, claw with seven or eight pairs of slender unequal fimbriae. Sepals are unequal, dorsal broadly ovate, tapering, its tip shortly recurved; the lateral pair oblong, pointed all glandular-hairy. 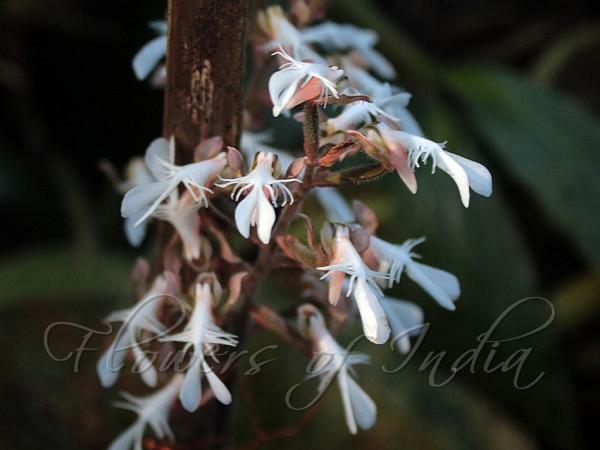 Roxburgh's Jewel Orchid is found in the Himalayas, from Himachal to NE India, Bhutan, Yunnan and SE Asia, at altitudes of 100-1600 m. Flowering: August-December.